As John Bonham demonstrated so well, you don't need masses of gear to sound good, but it helps if what you do have is of a high standard. While there is an inescapably retro angle to the Giant Beats, they do share many of the timeless qualities that make Bonzo's playing ever popular and influential. Classic cymbals that are practically as relevant today as they were nearly four decades ago. Their very nature dictates a lack of choice of models and sizes. 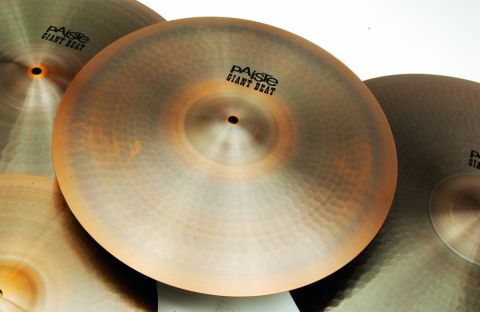 Paiste's Giant Beat cymbals represent something of an evolutionary link in cymbals. Originally launched in 1967, the Giant Beats were the forerunners of Paiste's now classic 2002 range and therefore could be argued to form the blueprint of many a modern rock cymbal. Giant Beats were designed to help drummers compete with the increasing volume and frequency ranges that bands were generating. The reintroduction of Giant Beat cymbals signified a wider trend among Paiste users. Far from being superseded by the company's more contemporary cymbal ranges, the 2002 series is more popular than ever. Paiste has responded by making 2002 cymbals a core series again and actually dropping its acclaimed Dimensions series. An expanded 2002 range incorporates the more popular and innovative Dimensions models. With the enduring 2002 line as resurgent as rock itself is, Paiste has quite rightly reasoned that the pioneering Giant Beat cymbals would be quite at home within the current musical landscape. Paiste's greatest endorsee is the mighty John Bonham and, 25 years after his untimely death, his association with Paiste is stronger than ever. This is hardly surprising; his influence on drumming grows as each new generation of drummers discovers his mastery. Despite huge advances in gear choices and recording technology, Bonzo's sound and beats still reign supreme. One of Bonzo's most admirable traits was that he did what he did with the minimum of gear. Yes, he used big drums, but despite Led Zeppelin's enormous success he was never tempted to stray far from his five-piece set-up. A similar economy informed his choice of cymbals and up until the introduction of Paiste's 2002 cymbals in 1971, Bonham used - you've probably guessed - Giant Beats. Fittingly, the Giant Beat range stretches to two pairs of hi-hats, two crash/rides that are labelled multi-functionals and one enormous ride cymbal. In 1967 this would have been considered more than enough to be getting on with. Back then, it was common for drummers to possess just two cymbals - a big one and a small one. Giant Beats are manufactured from Paiste's famous CuSn8 bronze alloy, better known as 2002 bronze. Paiste had been experimenting with the alloy since the early '60s, but the Giant Beats were the first marketed CuSn8 cymbals. The cymbals don't share the golden shine that is the trademark of the 2002 models, being a little darker and dirtier in colour. This is probably due to a slightly different tempering process, though the way they are finished can also inﬂuence the outcome. The cymbals all have a near identical ﬂattish profile that leads up to an averagely proportioned bell. Tight, shallow lathing bands spread evenly from the centre hole to the edge of each cymbal, both on top and beneath. Closely packed and very neat hammer marks are also visible across the top of the cymbals, covering most of the body with the exception of the bell. Intriguingly, the Giant Beat logo is written in a font similar to that of a Wild West saloon bar. The hi-hats are available in diameters of 14" and 15". While this indicates that the Giant Beats are aimed principally at rock drummers, the cymbals are not as loud as the sizes would suggest. The 14" hats are typically Paiste-like, producing a clean response that is straight down the middle in terms of frequency range. Beneath the bright shimmer is a warm and woody tone that lends itself to thick eighth-note figures and gives a soft stepping chick. The two cymbals are fairly evenly matched, with a medium thin top being paired to a medium heavy bottom. Whereas thinner or more radically matched cymbals can sound complex or trashy, this combination gives the hats a mellowness that still cuts through. The 15" hi-hats are fabulously meaty and possess a much deeper and bigger note. While they become forceful when laid into, there is a smooth, harmonic quality to them which makes them a pleasure to play. And in case you're wondering, yes, we did attempt the intro to 'Rock'n'Roll' with them. The results were awesome to say the least. The two multi-functionals come in at 18" and 20". Despite their largish diameters they are not excessively heavy. The 18" opens with a bright note that is about perfect in terms of pitch. It is sharp enough to cut through while being deep enough to sound full and rounded. The bell provides good separation for ride patterns but is understandably on the high side. Moving up to the 20", the bell is far more authoritative, particularly when played with the shoulder of the stick. The 20" is excellent as a large crash as well, sounding civilised and musical. The 24" ride is a fair slab of metal, but again, weighs less than you might expect. In an age of Cool/Dark/Dry/ Power rides it's a pleasant surprise to be presented with a general purpose ride cymbal. In other words, one that goes 'ting' on the body, 'ping' on the bell and does everything else in between with a good deal of warmth and expression. There is plenty of wash generated - unsurprising for a cymbal two feet across - but it is a silvery, sweet wash that decays gently. When you strike them hard, the ride opens for a huge crash that sits exceptionally well with the 18" and 20" multi-functionals. Warming it with a mallet meanwhile produces an amazing sounding gong-like swell. Though the myriad choices available nowadays is by no means a bad thing, it's refreshing to find a cymbal range that is so small. The limited number of Giant Beat models is partly authentic detail and partly an embracing of the very spirit of the cymbals. Giant Beats are simply cymbals - big, warm and musical ones, natch - and what you see is what you get.